I was surfing the web and came across Stacy Nash's designs on Pattern Mart and decided to download "Early Style Alphabet Pinkeep Pillow." 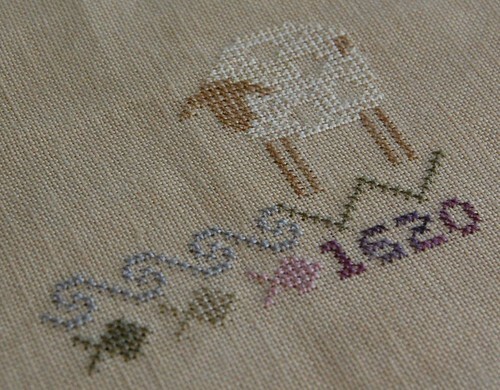 I thought it would look pretty on one of the new fabrics I got recently (40 ct. Purely Primitive). I got just a little bit stitched before my eyes started to go cross-eyed because of the 40 ct., which I actually think is smaller than 40 ct. because of the dyeing. So I decided to also start "Thankful Sheep." What a difference! I love the look of 40 ct., but I don't love stitching on it so much! Anyway, here's my little progress pic of that one.. I'm having a lot fun stitching this one, I should have it finished fairly quick. Well, not much else going on here! Just hanging out with Matthew while his brothers are in school. Write later! Ohhh, both are so pretty! Love the colors...floss and fabric! It's sure cute. I need to finish or frame mine! I use 36 count when something calls for 40 (unless it's a really tiny design). 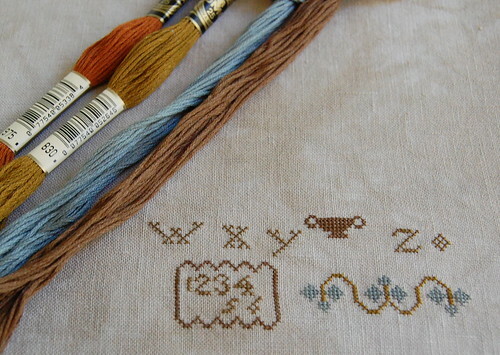 It still looks good with one strand and the needle doesn't have to be "pushed" through the linen. That's the part I don't like about 40 count. They're both lovely - I like the fabric you're using for the SN piece. I share the same feelings about 40ct. It's worth the trouble, though! These are both so pretty! I can't even begin to stitch on 40 ct without my mag light so you do quite well not having to use one. I love the little sheep! Both of these are just awesome! 40 ct! you rock :) Love the starts and the west coast finish is wonderful too! Both starts look great ! Thankful Sheep's looking great and you'll probably finish it in another session. It's such a cutie! Both starts look gorgeous! Great designs, nice colors, beautiful fabrics! Love your Stacy Nash start. I may have to invest in some of that Purely Primitive fabric - pretty!